Jockey Barry Geraghty went to the top of the Festival’s jockeys’ table when Spirit River won the Coral Cup for owner Michael Buckley and trainer Nicky Henderson. 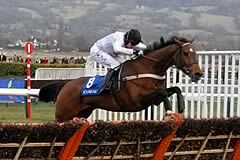 Buckley said: “He’s a young horse who will be chasing next year, so it’s a bonus to win a race like this. I’m an idiot, so I always fancy my horses - it’s my downfall. It’s years since I’ve had a winner at the Festival in my colours - Thumbs Up in the [1993 Vincent O’Brien] County Hurdle was the last one and that year I’d had a terrible Festival and didn’t have a shilling on him. Spirit River had finished unplaced in the totesport Trophy at Newbury on his previous outing, but a blunder there was a factor in defeat said Henderson, who added: “He did look as though he was going very well at Newbury, but a mistake at the third-last turned him sideways and that was game over. Henderson reported that Punchestowns, unplaced in the RSA Chase, was “quite sore” and lame behind. He also added that Binocular, “is happy in his box and getting lots of treats”. Barry Geraghty, after riding his second winner of the day on Spirit River in the Coral Cup, said: “It’s been a good day. They didn’t go that quick so I worked out a nice position on the way in and he jumped brilliantly for a five-year-old. “I had a fair idea that Spirit River would stay but he is only five so it was a good performance and he kept on really well. Nick Gifford acknowledged that he was as surprised as anyone at The Festival when Tullamore Dew, at a withering 80/1, chased home Spirit River in the Coral Cup. The horse was second by four and a half lengths. “I’m a little bit stunned really. It is very, very difficult to keep this horse sound. That’s why he hasn’t run for such a long time. It wasn’t a major plan or a coup, he’s just been a bugger to keep sound. “He’s got terrible feet, joints everything and it’s a big thank you to the team at home. Carol rides him out every day, his feet get poulticed every night, he’s got glue-on shoes, the physio does him every week, the chiropractor does him... the list is as long as my arm. “But it just fell right for him today. It was either this or the Pertemps and I thought, ‘Is he an out and out stayer?’. I mean he’s not slow. “But it just fell right today. The trip, the ground, and Liam (Treadwell) gave him a peach of a ride. Right round the inner and he’s such an electric jumper that I always knew he’d hold his position round there. He gave him a breather at the right time and we were only beaten by a very good horse. “We haven’t had a winner for a while and everybody was a bit down. But this will change things. “One of the owners passed away just over a year ago, Tommie Keogh, and he had horses with dad [Josh] for twenty years - his sister and ex-wife are here today - and never had one good enough for Cheltenham so he’ll be smiling up there,” said Gifford.